"Thank you for taking care of the star thistle in my horse field it was so bad I couldn't even let my horses in that pen because the star thistle is poisonous to horses but your goats were able to eat it with no problem I am so happy with the outcome and after two seasons the goats have rid me of my star thistle problem"
We really enjoyed renting a herd of ten goats from Ray and Virginia. The goats are so well socialized with people, making the time spent with us a lot of fun. We got to know the goats by their names and they were very friendly to us and everyone we brought out to see them. Not only were they fun to have here, they were non stop workers clearing lots of overgrown blackberry vines and witches broom that had grown unattended for years and they cleaned out the creek that was overgrown with blackberries. Our property looked like a well groomed park when they finished their work. Ray set up the electric fencing, water, and shelter promptly and came to check on them periodically. 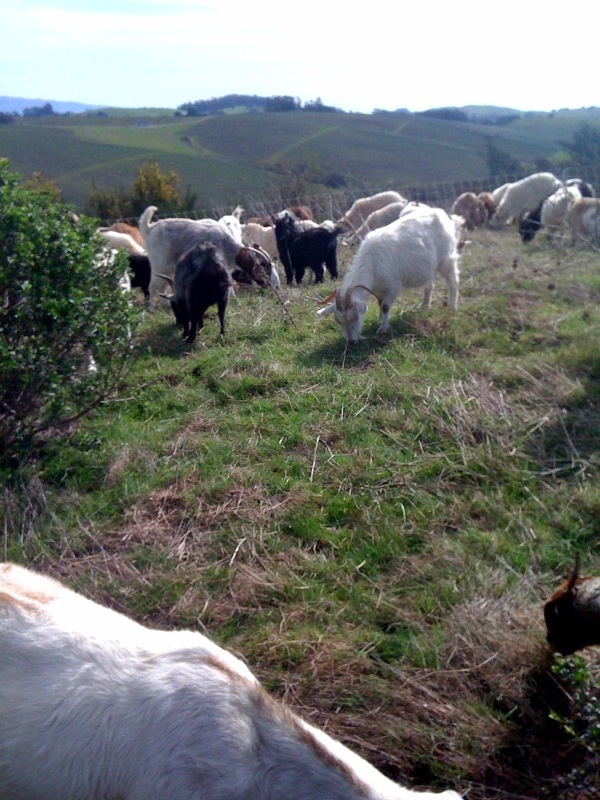 The goats seemed used to moving to new properties and settled right in to work. He handled the goats with expertise and it is obvious the goats are a part of his and Virginia's family.